According to the U.S. Federal Highway Administration’s publication of “Corrosion Costs and Preventative Strategies in the United States”, metallic corrosion affects every U.S. industry sector to generate $138 billion in costs. Out of that cumulative figure, almost $18 billion can be directly attributed to production and manufacturing. 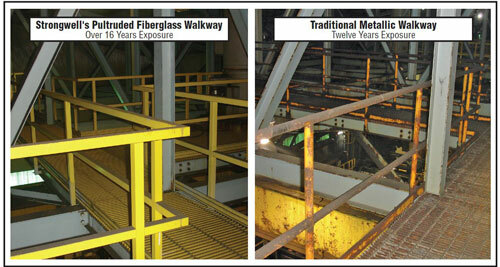 How a highly abrasive coal preparation plant in Illinois went from replacing carbon steel every two years and stainless every six years to FRP rails and walkways which are still in place over sixteen years later. Why round FRP handrail was chosen over traditional materials to build an OSHA-compliant bridge fender handrail system in Florida. Why Latin America’s second largest petroleum company chose FRP over steel to provide safe access to living quarters on its offshore platform while saving weight and preventing corrosion. The structural and aesthetic features and benefits of round, square and channel top handrail systems offered by Strongwell. How FRP addresses specific corrosive materials and environments. The differences in installation and fabrication of FRP handrail as a replaceament for traditional materials (steel/aluminum) or as a new installation. How FRP complements safety management through its low thermal and electrical conductivity. Click here to view the specific case studies.